Give your tree or plant an instant festive look for Christmas with mini nativities! The Heureux Noël Miniature Nativity at home on the small wire-and-beads Crèche Tree. The Three Angels Miniature, seen at upper right, above. With Christmas just around the corner and the 11-foot Crèche Treestill up in the attic, what's a guy to do? I fell in love with this three-foot-tall wire tree with crystal beads at my friend Joni's antique shop. The question was, what to decorate it with so its slender branches wouldn't droop? Miniature nativities!So I've been cutting and pasting with my mouse, X-Acto knife, and small scissors. My Miniature Crèche Tree is shown at left above, with the Heureux Noël Miniature Nativity front and center. Named for the French greeting of the vintage original, the Crèchemania Premium Download features "Merry Christmas." 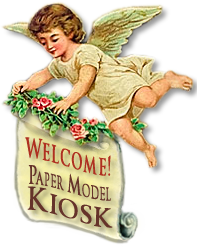 I also couldn't resist giving you a sneak preview of theThree Angels Miniature Nativity, justone of the seven miniatures I've completed — and I'm uploading to the Paper Model Kiosk. I looked at the Nativity no. 25, The Heureux Noël from the L’ Institut Canadien de Québec in the Crèchemania Collection at your site. Did you change that one into the Heureux Noël Miniature Nativity with window? If so, I can only say that you are an artist with Photoshop!! Thanks for your vote of confidence, Ellen! All our offerings are based on vintage nativities in the Crèchemania Collection, and the Heureux Noël Miniature Nativity is no exception. As you noticed, the lovely L’ Institut Canadien de Québec crèche does not have a window. But I remembered the paper Christmas tree decorations my youth, tiny houses that glowed with polychrome cellophane windows. , which does feature a multi-pane window. Just place a tiny light behind the cellophane, and the manger glows! As you guessed, in Photoshop, I simplified the Twelve-pointed Star Crèche nativity scene in keeping with the spirit of the Heureux Noël façade — and the miniature scale. 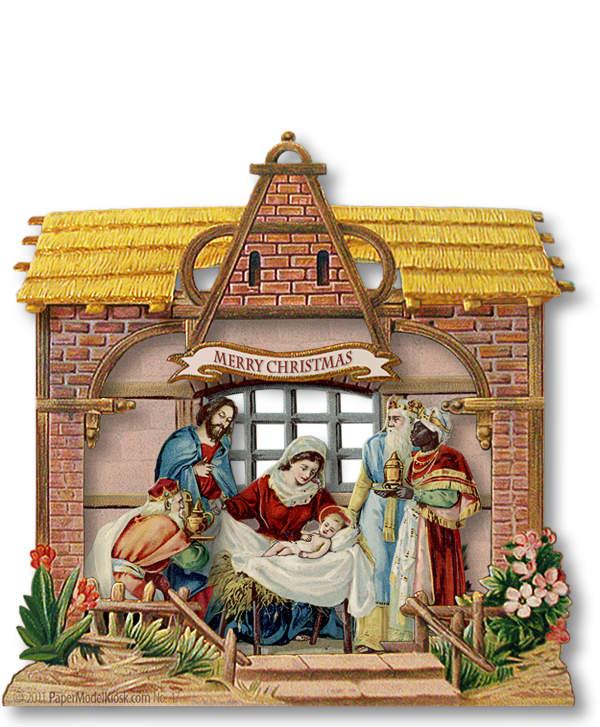 At 3.5 x .75 x 3.5 inches and .10 ounces, this miniature nativity Premium Download can hang just about from anywhere and be printed with Merry Christmas or, "Heureur Noël." Buy Heureux Noël Miniature Nativity as part of a collection, and save!